I love blueberries, but they are usually too expensive to buy fresh at this time of the year. When looking through the grocery ads last week I saw that one of our local stores had them on sale. I made sure that they were on my shopping list. I really wanted to make scones with them, but I also wanted something a little different. I found a recipe that paired banana with blueberries for a scone recipe. After seeing the recipe I decided that this was the recipe that I would try. 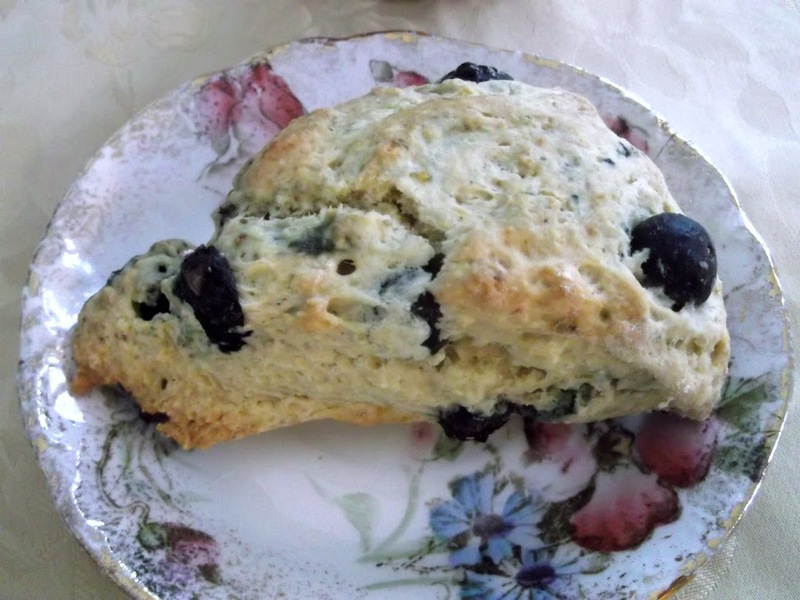 The scones had a hint of banana flavor, so it did not overpower the blueberries. 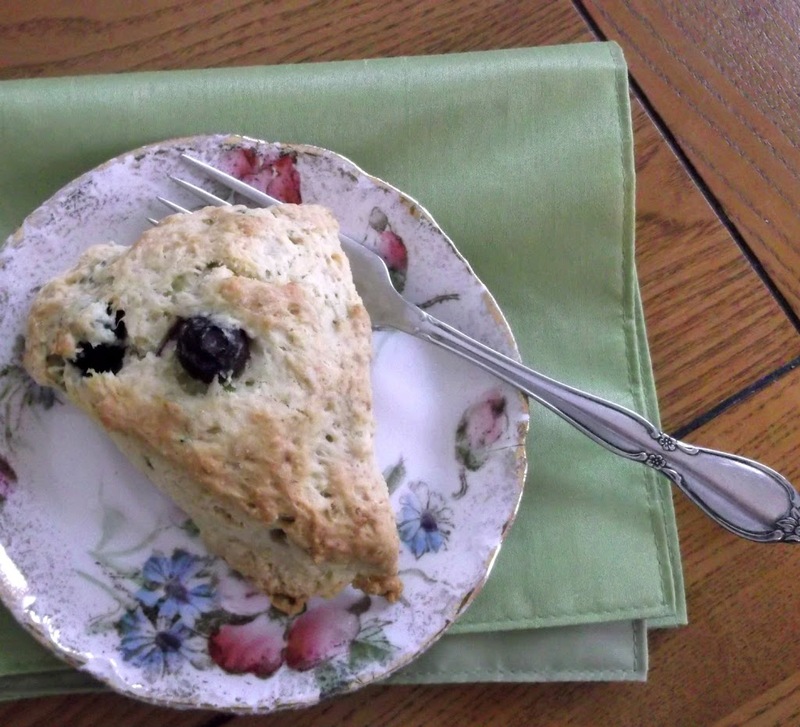 It was an interesting combination of flavors; overall I would say that we enjoyed these scones. But maybe next time I would use a little more mashed banana so the flavor would come through a little bit more. What have you paired together for your scones? I would love to hear what your favorite scones are. Stir together flour, sugar, baking powder, baking soda, and salt. Cut in the butter until mixture resembles fine crumbs. Add sour cream and banana, stir until moist. Gently fold in the blueberries. On a lightly floured surface form the dough into a 7 inch circle. Cut the circle into 8 wedges using a pizza cutter or a sharp knife. Place on lightly greased baking pan and bake in a 350 degree oven for about 25 minutes or until scones are lightly browned. 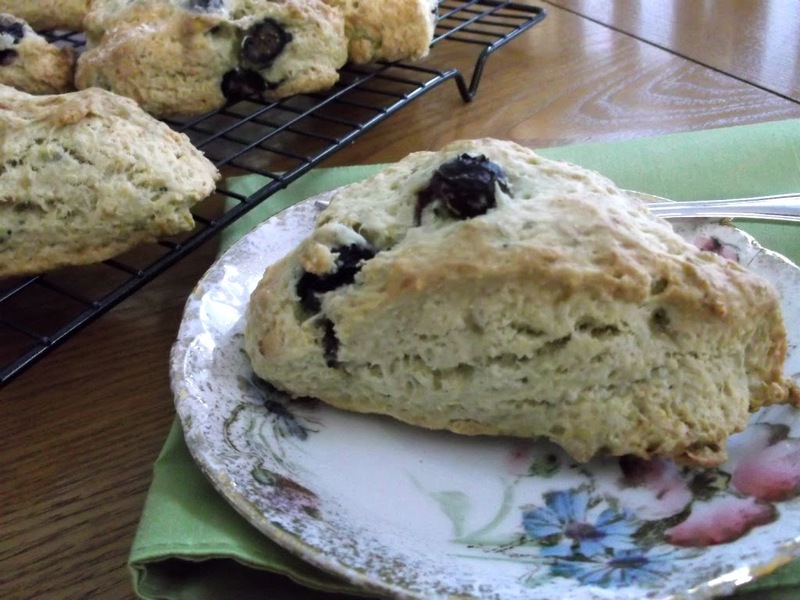 Hi Dawn, I made my favorite scones twice last week – first for our selves, the second time served them to my colleques at the work … That is, Your Buttermilk-Blueberry Scones with Lemon Glace! I look forward of trying this recipe with banana – yum! Gosh, it’s been so long since we’ve made scones! Love the idea of blueberries in them – they’re one of my favorite fruits, and so healthy. These look wonderful! Good stuff – thanks. Blueberry scones are my favorite! I love that you added banana to these. Love homemade scones and these look delicious. Blueberry and banana is an interesting combination of flavors! This is not a good recipe. The mixture is dry and hard to work with. No eggs? No milk or cream? Nhsve madr scones all m adult life and this is the worst. TheyTasted extremely dry. Sorry but I give this an F in the grading system. Jill, I am so sorry to hear that. Usually, I get praised for my scone recipes, I am sorry I let you down!